Q. What is Lithotripsy ? Lithotripsy is a non-invasive procedure that uses shock waves (thus the term Shock Wave Lithotripsy) to break up stones that form in the kidney, ureter and urinary bladder. The alternative names for Lithotripsy procedure are Extracorporeal Shock Wave Lithotripsy (ECSWL), Laser Lithotripsy, Percutaneous Lithotripsy, Endoscopic Lithotripsy or Intracorporeal Shock Wave Lithotripsy (ICSWL). Q. Who is an ideal candidate for Lithotripsy ? If you have stone(s) in kidney, ureter or urinary bladder then you are an ideal candidate for Lithotripsy. In order to determine who is an ideal candidate for Lithotripsy, it is also important to keep in to consideration the size, location, shape and number of stones in the urinary organs. Q. What does the procedure of Lithotripsy involve ? You will be instructed not to eat or drink anything at least 12 hours before the Lithotripsy procedure. Wear comfortable clothing so that you can change easily into a surgical gown for the surgery. The entire Lithotripsy procedure may take approximately one hour. You will receive local anesthesia with sedation to minimize pain and discomfort however, at the same time you will be required to stay still during the Lithotripsy procedure. You might experience a mild tapping sensation during the procedure. There might be mild discomfort or pain during the procedure. There are two techniques available that are equally effective and widely used at most medical facilities. One method is that you will lay on a soft cushion through which the shock waves pass. About 2 - 8 thousand shock waves are needed to crush and fragment the stone(s) in a single Lithotripsy procedure. The second method is you will be asked to lay in a special tub filled with warm water, stones will be located and visualized by x-ray or ultrasound and shock waves will be directed from the Lithotripsy machine called Lithotripter. These shock waves will pass through your skin and are completely harmless. The procedure described above is that of Extracorporeal Shock Wave Lithotripsy (ECSWL). For Intracorporeal Shock Wave Lithotripsy (ICSWL), an endoscope or Cystoscope is used to get close to the stone inside the urinary tract and laser waves are applied to fragment the stone into small particles. Intracorporeal Shock Wave Lithotripsy (ICSWL) or Laser Lithotripsy is usually performed when the Extracorporeal Shock Wave Lithotripsy (ECSWL) technique fails. The sand like particles of the stone are either fished out in a basket attached to the Cystoscope and extracted out or they are passed out naturally during urination. Sometimes a stent is inserted in the ureter to keep it patent and facilitate the passage of stone fragments and debris with the urine, over the next few days. You will spend the next couple of hours in the recovery room under observation for bleeding or any other immediate complications. You will be allowed to go home after one or two days following the Lithotripsy procedure. You will probably have a lot of blood in the urine after the Lithotripsy procedure. This is normal and should clear after several days or so. Lots of fluids should be taken to encourage the flushing of any gravel (forced diuresis) remaining in the urinary system. For the next couple of days after Lithotripsy, you will be instructed to collect your 24 hour urine and send it to the laboratory for analysis of the debris. You will be prescribed pain medication, antibiotics and anti-inflammatory medication to relieve pain, treat infection and subside inflammation. Drinking plenty of clear fluids (including water) will prevent the kidney stones from recurring. You should follow up with your urologist in about two weeks to make sure that everything is going well. If a stent has been inserted during Lithotripsy, it is normally removed at this time. In about a week you will feel better and can resume your normal activities. Lithotripsy is a non-invasive method to treat and remove kidney stones that requires minimal hospitalization, reduced chances of postoperative complications associated with surgical procedures and much quicker recovery. People who have kidney stone(s) that are mobile benefit tremendously from this procedure. 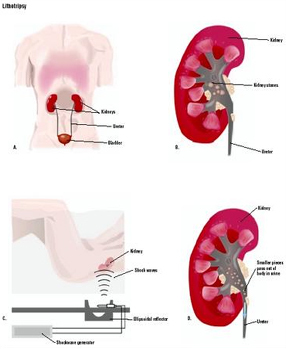 The invention of Extracorporeal Shock Wave Lithotripsy (ECSWL) and Intracorporeal Shock Wave Lithotripsy (ICSWL) techniques is a blessing in disguise for people who suffer from colicky pain and repeated urinary tract infections as a result of stones in the urinary tract. Lithotripsy is generally safe. However, as with any medical procedure, complications can occur. Pieces of stone are left in the body. You may need more treatments. Bleeding around the kidney which, in rare cases, may require a blood transfusion. Damage to the kidney tissue or nearby structures in the stomach area may occur from ESWL. Some patients are at greater risk than others. Blockage of urine flow from the kidney due to pieces of stone. If this causes severe pain or blockage of the kidney, a tube may be placed through your back and into the kidney to keep the kidney drained until all the fragments pass out. Sometimes, a thin mesh tube called a stent is placed into the body (from the kidney to the bladder) before ESWL to prevent this from happening. A stent is usually put in the body after laser lithotripsy. Contact your health care provider if you have any of these symptoms. Whether or not ESWL causes or leads to the development of high blood pressure and diabetes remains controversial. You may want to ask your doctor about this before having the procedure.